Today’s workplaces require a range of employee communication styles and spaces. Aria Hosted offers Cisco unified communications solutions, like Cisco instant messaging and web conferencing tools, to allow your team to work more efficiently, deliver faster results, and just be more productive overall! Cisco Spark™ drives team productivity. 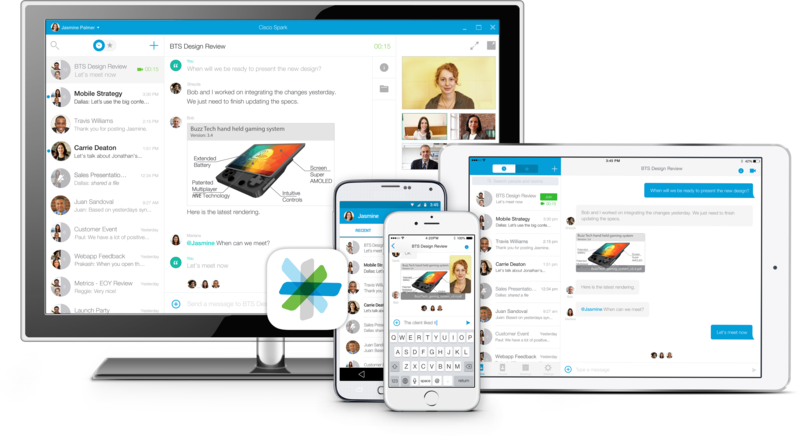 Instant Messaging by Cisco Spark™ gives teams a full-featured communication platform that integrates securely with your business network. Find the right people, see they're availability, and collaborate in more ways than you can imagine. * External calling through Cisco Spark not available at this time. Getting a bunch of busy people together for a meeting can be a tough ordeal. Pull everyone together in your personal meeting room with a unique URL to save time and ensure attendance. See the same things at the same time and make decisions in real-time.